Martha Farnsworth lived in Topeka and documented her daily life from 1882 to 1922. Her diary provides an insight into the customs of the day and often references happenings in her local community. Farnsworth lived at 2200 SW 10th Avenue, and her October 31, 1917, diary entry offers a description of a Halloween party she hosted for friends. 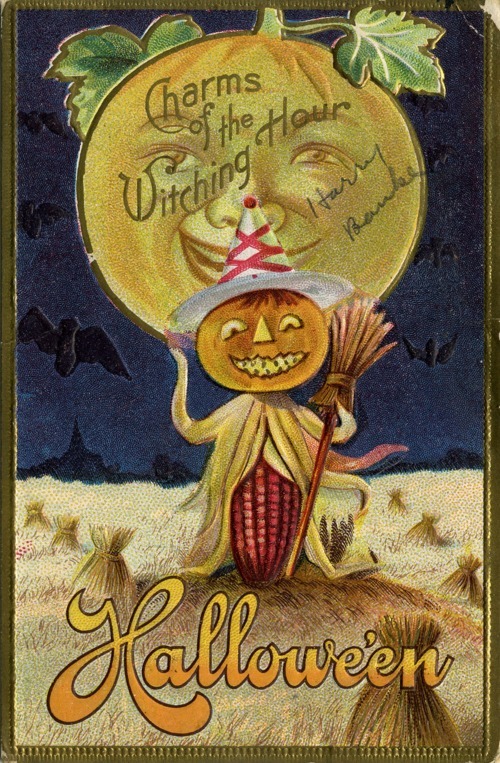 Wed.31 A splendidly fine day—I put up my Halloween decorations, and worked hard all day, yet am not tired. And this evening the young folks came and we had a very jolly Hallowe’en together, with the usual stunts fortunes, etc. I served Cider, “Witch cakes and dough-nuts—the Witch Cakes had a ring (Ron got it) a penny and Hellen Rolly got it, and a thimble, drawn by Scott Brown. Those who came, were Scott Brown, Dorothy Christian, John Perine, Carrie Wiede, Jack Miller, Helen Rolly, Virgil Scholes, [XXXXX] [XXXXX], Robt. Sympson, Nancy Boone, “Babe” Monahan, Helen McCahan, Luther Davis, Lillian Larson, Charlie Plath, Olive Monroe, Ronald McGord Lucile Maguire, Earl Parmer, Rose Rogers, and Fred Brackett. I gave them all Halloween boxes of “Dream” cake as Souvenirs.